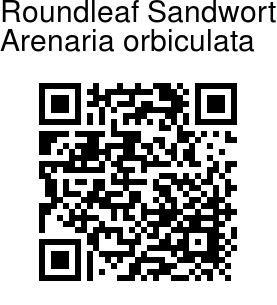 Roundleaf Sandwort is a biennial or perennial herb. Stems are erect or prostrate, dichotomously branched, slender, 5-40 cm long, velvet-hairy along 1 side. Leaves are stalkless or stalked, elliptic, ovate, or nearly round, 2-10 x 2-7 mm, both surfaces hairless, or sparsely hairy only on leaf-stalk, 1-veined, base rounded, tip blunt or mucronulate. Flowers are borne in few-flowered cymes or soliary in leaf-axils; bracts similar to leaves but smaller. Flower-stalk are 5-10 mm, hairless or very sparsely velvet-hairy. Sepals are 5, lanceshaped, ovate-lanceshaped, or ovate, 3-4 mm, hairless, margin narrowly membranous, tip pointed. Petals are 5, white, obovate, shorter than sepals, base narrowed, tip blunt. Stamens 10, shorter than sepals. Ovary ovoid. Styles 3, linear. 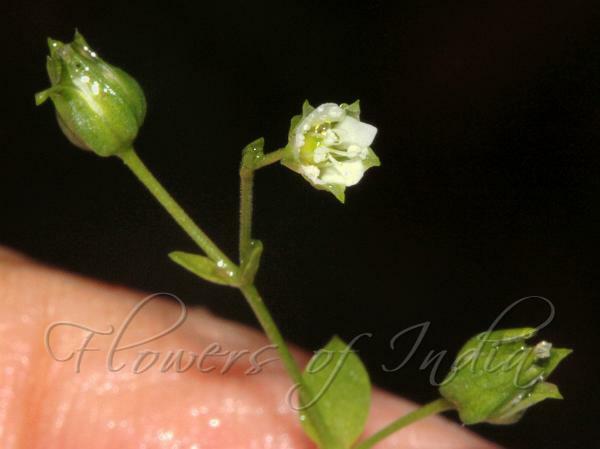 Roundleaf Sandwort is found in forests, scrub meadows, alpine meadows, stony valleys of the Himalayas, from Kashmir to Bhutan, at altitudes of 2300-4500 m. Flowering: May-July. Identification credit: Gurcharan Singh Photographed in Mandal area, Uttarakhand.